Crystal Jade (1/18): Only the Korean this time. Cedele (1/10): Tuna melt sandwich and iced tea. Kaisan (1/7): Chef Johnson stir-fried some ramen with mentaiko, a refreshing, and no-cream deviation from the usual pasta style. From the sashimi counter, kodai sashimi was served in the classical style as well as dipped into a fresh-ginger-scallion dip. Also sweet buttery scallop and more of the grilled sama while the season lasted. Spizza (1/6): The usual. Ursula, no cheese. Ichiban (2/6): Nabe udon for lunch. Salmon nabe for dinner. Royal China (1/4): I have a new addiction- stewed goose webs and sea cucumber. The goose web has high cholesterol, and sea cucumber purportedly lowers it, so it makes sense to eat them together I guess. Another reason to eat there is their apple crysanthemum jelly, husband is still trying to figure out how they make theirs so subtly perfumed. Blood Cafe (1/4): After my gynae appointment, again. I ordered the blackboard special of Welsh Rarebit, and it came in a big, indulgently rich portion that I could not help but finish. Me bad. No Signboard, Esplanade (1/4): Dinner with friends. They finally had big crabs! Finger-licking-thumb-sucking good. 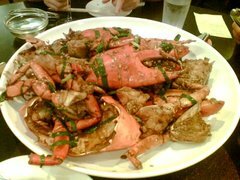 This white-pepper crab consumption is turning into a serious habit too. Pontini, Grand Copthorne Waterfront Hotel (1/3): scene of a wine dinner featuring Tuscany winemaker Castello di Brolio. Before dinner, there was a vertical tasting of their vintage chianti classicos from 1997-2001. Then a rich and sumptuous dinner was served to match with more wines. Foie Gras terrine. Heady Tuscany soup of prawns and fava beans. More wines followed, mostly chianti classicos. Chef Francesco Greco sent out more food. Wild mushroom risotto. A perfectly cooked beef tenderloin. A redundant dessert of chocolate puff pastry with sabayon, redundant because by that stage everyone was completely satiated and full to bursting. LeBistrot (1/2): Dinner with friends. The pig head salad was wickedly good, they must never take it off the menu. Their home-cured gravlax was well-made too. Vansh: This upmarket restaurant-lounge looks a bit lost in its current location; the Indoor Stadium is not really the venue that the city's hip people naturally gravitate to. The modern North Indian food is worth schlepping over for I suppose, their tandoor cooks are quite masterful at turning out excellent naans and grilled meats and seafood. Street snacks such as crisp puris accompanied by light tamarind water was a refreshing change too. The service was efficient but cold and aloof. Vansh and its parent restaurant Rang Mahal have the same failing. They like to reserve 'better' tables in case better customers who may come along later. We have, on more than one occasion, walked into their empty restaurant to be automatically shown not-so-nice tables e.g. in the middle of room, flanked by pillars, in the sun's glare, in the dim corner, etc. When we requested for better table, they try to deflect our request with mutterings of "oh it is reserved"; fine if that is the case, but more often than not those tables remain empty even after we finish our meals. Peach Garden: Lunch treat given by my boss. I liked their young coconut jelly dessert. For the mid-autumn festival they also featured a less common but elegant red date paste mooncakes. Fish & Co: Sometimes I just want a piece of fresh fish grilled and served with chips. Fish & Co delivers just that. Ming Chung Heng Hwa, Maude Street: scene of montly makan session with friends. HK Street Chun Kee, Novenaville: another makan session with friends. 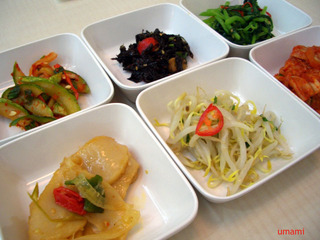 Jeju: A small Korean restaurant along Purvis St. We ordered simply. Ginseng chicken. Spicy ramen. Spicy squid with rice. The ginseng chicken does not match up to Crystal Jade's but it is more reasonably priced. The spicy ramen was quite plain but the noodles made up for it with its springy bite. This place is definitely worth returning to. Max Brenner, Esplanade: Where we adjourned to after our crab feast at No Signboard. Their waffles with chocolate sauce tasted really good, especially when paired with gorgeous stickies our wine-loving kakis provided. Dian Xiao Er, Marina Sq: Similar to Soup Restaurant, this Malaysian-based mid-priced family-style restaurant specialises in duck roasted with Chinese herbs. The ducks are not that fantastic actually, the herbal flavours crude and masked with too much sugar and MSG, but that didn't stop the crowds it seems. I prefer their side dish of kailan stir-fried with plenty of lemongrass and salted fish. Carl Jr's, Marina Sq: The latest fast food sensation from US. Since we were in the neighbourhood we gave it a go. Did not like the too-bready beef burger, maybe that is a ploy to get people to order the double-patty version. The fries were limp. Gave them another chance with the Fish Sandwich which was a big improvement as the fillet was thick and the batter still crispy when the sandwich was served. At work, too boring. Only highlight was the chicken porridge place at Jurong West. Otherwise it was mostly Spinelli's- some of their sandwich seems to come with better breads nowadays.